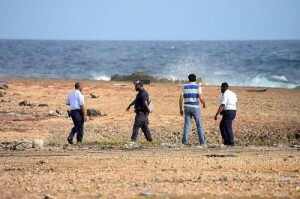 WILLEMSTAD - Once again body parts have been found at Koraal Tabak, north coast of the island. Police officers rushed to the scene and seized the human remains for identification. Because Venezuelan media reported earlier that there were 34 victims of the boat disaster on the north coast, it is expected that more human remains will be found. Certainly some of the passengers - how many is still unclear - have reached the island alive. In any case, it concerns two men who were arrested on the same day that the first four bodies were found, and two other men voluntarily reported to the police last week. In addition to the body parts, various items have been found in the meantime, such as clothing, footwear, bags and mobile phones. The mortal remains of identified victims will be transferred to Venezuela with military aircraft to be buried by their relatives.